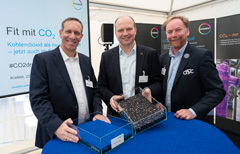 Fit with CO2: Daniel Klomp (Sport Group), Dr. Daniel Koch (Covestro) and Robert Haake (sorts club CHTC) at the opening ceremony of the worldwide first hockey sports field made with carbon dioxide (from left to right). This press release is available for download from the Covestro press server. There you’ll find also a video, an infographic and pictures. Please acknowledge the source of any pictures used.